24 December 2016 "The Paranormal View"
With the 2016 year-end shows landing on Christmas Eve and New Year's Eve, generally we provide the rare Encore Presentation. 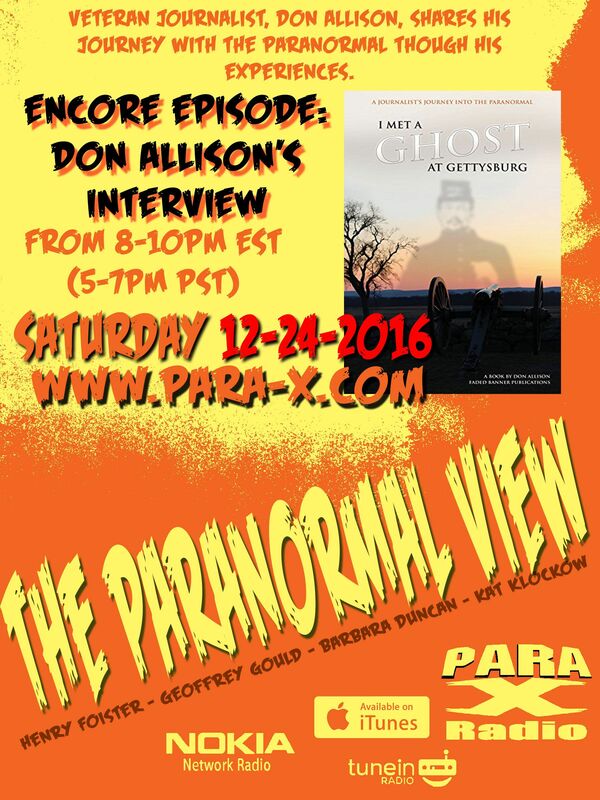 Our guest was author Don Allison of I Met a Ghost in Gettysburg. Kat and Ceiling Cat Barbara Duncan explained to Henry that my absence was due to me participating in a CERT training, with which I was helping out a film maker friend who was on the Canoga Park town counsel. Henry had Don start out with his early experiences, considering how oblivious to the paranormal he'd started out, getting into the investigative aspects "kicking and screaming," as he put it. While still in a non believer mode, he experienced a near car wreck, saved from which he wasn't sure whether to attribute to paranormal influence, as well as the house into which his family moved. The house had been found by a "quiet listing;" his son originally was looking, but it was more of a Fixer Upper than for what he was looking, while Don and his own wife loved the place, and they went for it. Don did tons of the repairs himself, for the floor cannibalizing matching wood from the original barn they also acquired. People unaware of the repairs would thinking the new floors were original to the house. Kat stressed fellow history lover Don should check out Mansfield Reformatory. Don hasn't been there, yet, but his son and daughter-in-law have visited there. Don's then new house was literally known as the Ghost House, one neighbour gave him several stories about actvities, but he also added a story about alien visitations as well. But as Don's renovations were ongoing, on the porch, wood rot of which Don had to strip away, the next evening he found a single, sitting-up pine cone placed on the center of the porch. Then as he went to close the heavy mahogany door, but it seemed to be yanked back from his hand, and he could find no reason for it to have been able to do that. Skype again was acting up; only Henry and the live chat room, and the recording that'd become the archived podcast, could hear the show's opening and closing, and commercial breaks. For Kat, CC, and Don, it was dead silence. After the first break, CC conveyed tonight our having listeners in the US, the UK, Canada, Singapore, and Unknown. Don spoke of experiencing specific activities that other people had long since experienced, such what sounded like a woman's running footsteps, and a loud door slamming. Upstairs he would sometimes hear heavy boots walking. Other times the sound of the door opening, when it wasn't actually physically opening, and the boots entering. The more being done on the house, the more activity would increase. Radios' stations would change their stations, the most annoying aspect of which going to sports games that were not teams of which Don would be a fan. He began to suspect Intelligence when, at one point he ordered that the radio station be left alone. A little while later as an Elton John song started up, the power cut off as the generator outside was simply switched off. Another time work gloves were substituted, as though the ghost/s were suggesting better working conditions. Don's formerly skeptical wife also began to accept Something Was Different as she began to experience similar ghostly activity. He spoke about the time/s he did hear ghostly voices. Once when he and his wife were going out, he had to go back to retrieve her purse. As he was reaching for it, in his ear he could hear a young woman's whispery voice remind him: "Be sure the door's locked." Another time ductwork on which he'd been working began getting pounded big time, sounding as though someone had broken in and trashing the house. Crowbar in hand, Don ran downstairs to the cellar at which point the sound stopped on a dime, and no dust that would have been flying had any physical pounding been happening. Some months later, Don's normally fearless brother-in-law, who'd even grown up in a haunted house himself, came by to do some wiring. He went to Don to notify him he owned him a new set of underwear. Turned out the brother-in-law experienced hearing the same pounding, causing him to flee the house. Don clarified the plumbing was not yet installed so it was not a case of air in pipes and such. Don doesn't go with every strange thing being part of the haunting; debunking various oddness such as from wind, or that birds were getting trapped in the chimney, which was handled once the chimney was capped off. CC wondered about, since Don began actually investigating the paranormal, whether he'd ever investigated his own place. While he'd done so once to appear a young relative, when the ghost reacted to Don's request, the boy was ready to Go Home. Aware that communication leads to more activity, and that he and his wife have a peaceful co-existence with his incorporeal rent-free guests, he doesn't do much in the way of strengthening that relationship. Intriguingly, the ghosts seem to acquired learning skills during the passage of time, experimenting with Don's computer's touch screen monitor, sometime opening multiple files as though working at deducing as to what does what. Occasionally now, Don's book's file will be opened on his desktop, always to different photography illustrations, as though while away from his computer, the ghosts were perusing the book. Placing near his computer one of those 1970s pin-toys with which to create hand prints and such, he came across two small child size hand imprints. As the activity is benign, Don indicated that he's gotten used to the majority of the activity. On morning he was awakened by his foot being tickled, on waking seeing a form in mid air. At this point I was brought into the room, but Skype kicked me off within a few seconds. "I think it's a record," Kat Skype-texted me. It wasn't until after the break that Henry discovered I'd been dropped from the call. Tabby in the chat room asked whether Don had been to Antietam, which he has, always aware he had ancestors in the charge. With about half hour left to the show, Henry finally got to Don's book. He spoke about his first time to Gettysburg; as a re-creationship, he was background in the movie Gettysburg. He spoke about how his camera "refused" to take any photographs of union monuments. Eventually it got to a point that friends urged him to write a book about his experiences, which he resisted, believing many would believe him off his rocker. In spring 2015 Don took his then 14 year old grandson Connor to Gettysburg for Living History, staying at the Colton Hotel at night in which they could both hear a man pacing back and forth, then a couple of hours later they could hear a cannon fire coming from Cemetery Hill. The next day he was told not only was that a regular experience, it was certainly was for that room, Don having been in the most haunted room in the hotel, the hotel itself being an official stop on one of the Gettysburg Ghost Tours. As he was there as a journalist, one of his Extra goodies was going on a ghost hunt. Don spoke about being brought to Sachs Bridge, where, despite regretably not having with them a digital recorder, they got some major communication via a spirit-box. Do gve out his online information, Facebook not letting me find his On My Mind newsletter on Facebok.